They get to some 3 to 3.4 metres (9.8 to 11.2 ft) long and part of their name comes from their habit of hunting in shallow, coastal waters. Right next to the sandy beaches where we have all our fun! They mainly eat fish, squid and crustaceans, so they have a huge choice, but its not nice to know that gnashers like that are lurking in patches of water all over the world. 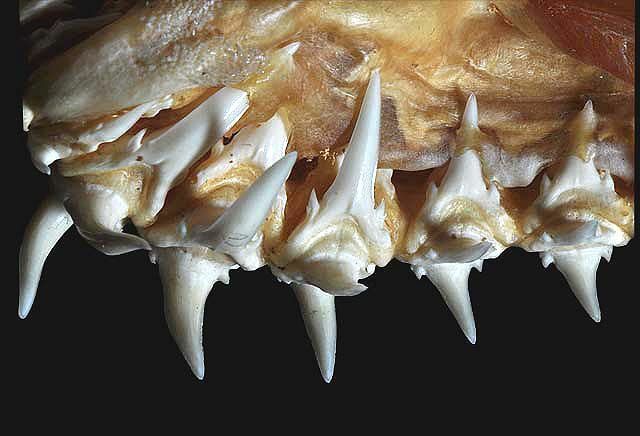 Indeed, Sand Tigers come armed with some of the most ludicrously vicious teeth ever. These are teeth that simply don't give a damn. It's like a guy who's so rich he dresses like a tramp. They don't stop. They just don't stop. And boy is this shark richly endowed! Teeth just spill out, row after row, like an excessively dangerous music box. Sand Tigers don't often bite off more than they can chew, but that's because they prefer to swallow things whole. Big sharks need big food, and ambitious Sand Tigers may even eat dolphins! The overambitious can get into all sorts of health problems when they try to swallow more than they can swallow. Like a rich guy getting into too much debt. But be at ease, dear reader! Two things allow us to paddle in the sea and feel reasonably safe with a Sand Tiger around. One, they are nocturnal. Two, they're actually quite docile! Shy even. And rather sluggish, too. They look significantly more perilous than they actually are. For us, anyway. Fish and squid still have a lot to worry about. 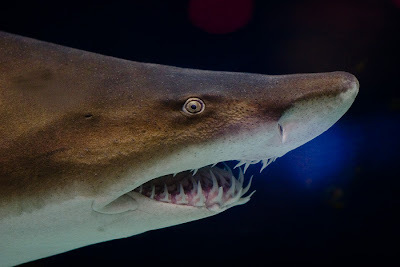 A unique feature of the Sand Tiger is that they gulp air and hold it in their stomach. It's not to help them provide us with a hilarious burp that would have the whole ocean bubbling with laughter, like when a Mafia don tells a rubbish joke. Rather it's to maintain buoyancy, allowing them to quietly stalk their prey without attracting attention. 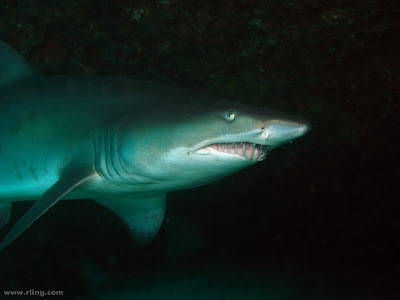 Unfortunately there is another interesting and appalling feature of the Sand Tiger. This one really does grab attention. Apparently, it was discovered after female Sand Tigers were captured and biologists probed their bellies with their hands. I find this an extremely peculiar thing to do, but whatever... I don't know what they were hoping to find, but I sincerely doubt they were expecting to get BITTEN! As it turns out, Sand Tiger Sharks do a little something called intrauterine cannibalism. One form of this is quite common in sharks, where the babies are fed unfertilised eggs while in the womb. Sand Tigers do that, but they also do something else. 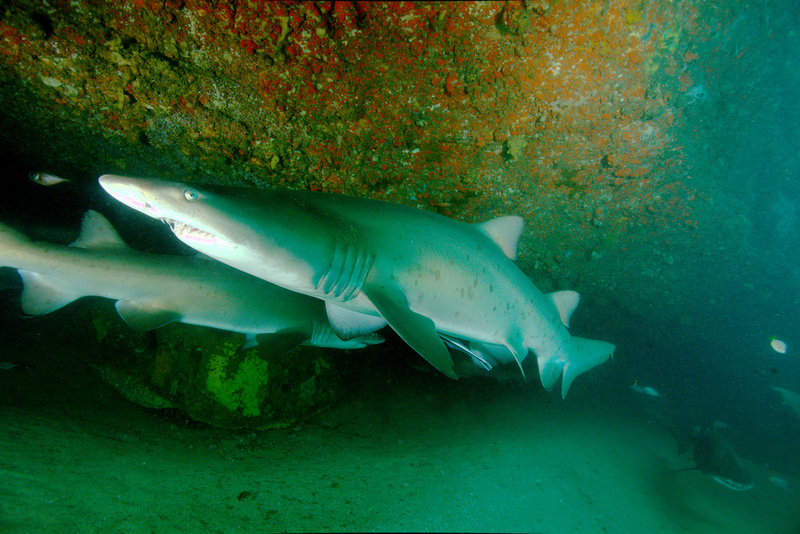 Also known as the Grey Nurse Shark. I want a different nurse. You know those birds who lay more eggs than they are actually capable of rearing? And only the strongest chicks will be able to get all the food they need, leaving the rest to die of starvation and thus fulfil their role in the beautiful balance and harmony of Mother Nature? Well, Sand Tigers do something a little like that. They're just a little more proactive about it. Sharks have 2 uteri and in each, there can be only one. Sand Tigers. In the womb. Kill and eat their siblings. Mother's very body veils a terrible scene of murder and a family torn apart by the fight for survival. Worse. Twin. Ever. With a strategy like that, it may not surprise you to learn that Sand Tigers have one of the slowest reproduction rates of any shark, just two pups every 2 years. 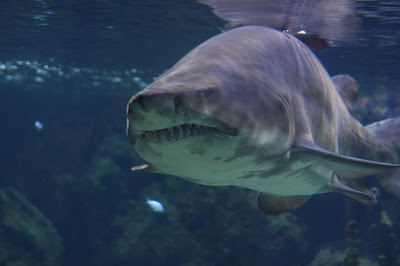 However, after about 9 to 12 months gestation a big, strong, 1 metre (3.3 ft) long shark is born, complete with all the gruesome teeth, physical strength and psychological scars it takes to be a really mean-looking shark. Ha! They're a bit of a shock! I don't know what kind of toothbrush could deal with it.